A modern holiday villa with pool set in a glorious position above the sea. Casa al Faro, set in the Plemmirio Nature Reserve just outside the historical centre of Syracuse, has all the ingredients for a perfect holiday home: clean lines, contemporary design, manicured lawns and a beautiful swimming pool. ¹ a pizza chef (a "pizzaiolo") is also available on request. Inside: accommodation at Casa al Faro is all on one floor. The front door takes one in to an entrance hall, off which most of the rooms are accessed. One door takes you into the generously proportioned, fully-equipped kitchen whose sea-view French windows lead out onto a shady al fresco terrace with barbecue and wood-fired pizza oven. The kitchen flows past a dining table into the living area. Comfy sofas, large French windows and views out to sea make for a very pleasant atmosphere. The sleeping quarters are accessed via the entrance hall, off which is the master double with en-suite shower room, a guest bathroom, and a corridor leading to three more bedrooms: a double with large French windows opening onto the surrounding terraces, double-twin, and a room with bunk beds. These bedrooms share a bathroom with shower and tub. Outside: accessed via French windows from the living area and kitchen is a large shady terrace furnished for lounging, dining and cooking (think barbecue and wood-fired pizza oven). There is also an outdoor fireplace, which is ideal for spring or autumn evenings. A few steps take you from this terrace onto the extensive, lawned garden, which features plenty of furnished areas for relaxing and taking in the view or sunbathing. The large pool has been designed with both swimming and fun in mind, and the youngest members of your group are catered for by a very shallow end separated from the deep end by an underwater bar. At the far end of the garden, right above the sea, is a superbly panoramic pergola, surely the best spot for a pre-prandial aperitif. 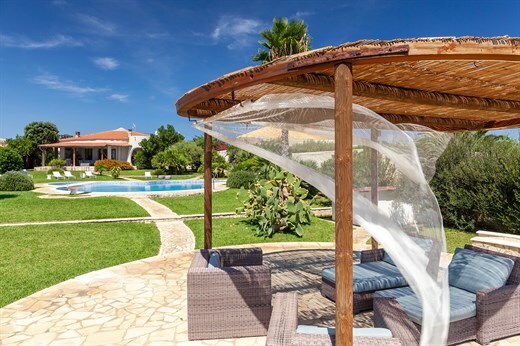 The villa is set within the Plemmirio Marine Nature Reserve, one of the most beautiful areas around Siracusa. There are several access points to the sea across the rocks which are within walking distance from Casa al Faro and there are several walks from the gate of the villa. Following the defeat of the Athenians in 413 BC Syracuse was arguably the most important city in the Mediterranean (and hence perhaps the world). Remains of that period are beautifully preserved in Ortygia, at Neapolis and in the fabulous archaeological museum, all of which are within a few kilometres drive of Casa al Faro. Syracuse is not just an Ancient Greek museum however. The old baroque island city of Ortygia offers a marvellous choice of restaurants, bars and shops in beautiful piazzas and on the sea front. Also within easy distance of Casa al Faro are white sandy beaches, towns such as Noto, Modica and Ragusa, Mount Etna, and much more. "Casa al Faro was outstanding. We loved all of it. It was very clean and the welcome canapés and food supply exceeded expectations." Quite simply Casa al Faro is exceptional. The whole team out there were great. The people who cooked for us were amazing chefs and really fun people. Casa al Faro was outstanding. We loved all of it. It was very clean and the welcome canapés and food supply exceeded expectations. The house manager was very friendly and kind, including his parents in-law, who helped maintain the villa. All very warm and welcoming. Casa al Faro and our trip was truly wonderful!! We loved the concierge service of The Thinking Traveller and would always try and book through you again. Casa al Faro was our favourite part of the holiday. All was wonderful. And the local chef was fantastic too. Everything was exceptional at Casa al Faro! It exceeded our expectations and made the trip! Wine at sunset there every night made the long journey totally worth it. Casa al Faro was absolutely stunning. It was a real oasis. The architecture of the villa, the gardens, the pool and the view was superb! Our cook and his assistant were brilliant! Thank you to all the team for having given us a great holiday! All absolutely perfect. Everyone who prepared the villa and cooked for us while we were there went out of their way to do a little bit extra and were extremely friendly and helpful. The cooking in the villa was top notch and certainly on par with some of the better restaurants we visited. The pizza evening was a big hit and Rodolfo was so patient with us. It's clear that the staff are very passionate about what they do and we really enjoyed learning more about Sicily from them. Overall we had a loverly time and enjoyed our stay. Definitely value for money and will use The Thinking Traveller again next year. We enjoyed the whole experience. The housekeepers were great. Fantastic hamper and wine delivery on arrival. Amazing pizza chef mid week but crowning glory was the in house chefs - the best homemade tiramisu I've ever tasted, Roberta's homemade limoncello and as a parting gift her own mandarin marmalade. Everything was excellent. It was a true family summer holiday that we'll always remember! I found it even more fantastic than what I would have expected from the pictures! The kitchen was fantastically equipped and the pre-arrival grocery shop was a blessing... a fabulous garden and pool. Look, it's getting a bit repetitive but I'm honestly not giving 5 out of 5 reflexively and without thought! The villa was perfect, it was everything the website brochure promised it would be and more, we really couldn't fault any aspect of it. Having paid the reduced couples only rate I consider that it was also excellent value for money. We spent a magical 7 days there and would highly recommend it to anyone who asked. We had a lovely family holiday relaxing at this villa and we would recommend it highly. A wonderful house that we very much enjoyed returning to. We had a fabulous trip - loved the villa, the location and the local hospitality. We will go back! The house was beautifully situated. We loved the house... The staff were wonderful and made the holiday perfect. The caretakers were very welcoming to us especially after such a long journey to get to the villa from Australia! They were most helpful in providing any information we needed. Wonderful hosts!... Sicily was a fabulous destination and the villa was in a great location to visit the sights of the south east. Would love to return to Sicily to see more of the island... Would definitely recommend The Thinking Traveller. The company is very professional and the service provided is excellent. We had a wonderful time and really did think Casa al Faro was perfect for our family holiday. Loved all our holiday... Villa cook was amazing. Best meal we had in Sicily. Lovely home in general...The local care takers were the most professional, warm welcoming couple that I have met and nothing was an issue for them. Please extend thanks to them. Just what the doctor ordered. Perfect for our family. We all had a really great time. Thanks! La vue est magnifique, la piscine et le jardin inoubliable.